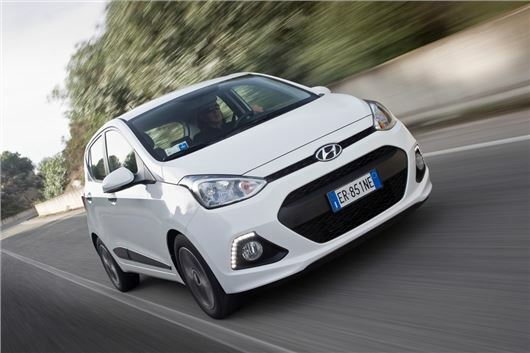 Designed in Europe - at Hyundai's Technical Centre in Germany – the new i10 is 90mm longer and 65mm wider than its predecessor, while luggage capacity is increased by 10 per cent to 252-litres with the seats up. Push the seats down and the capacity increases to 1046-litres – a best-in-class figure. The new i10 shares the same platform as the Kia Picanto and will be available with two efficient petrol engines - a 1.0-litre with 66PS and a 1.2 with 87PS. The 1.0-litre, three-cylinder powertrain is expected to make up 60 per cent of all sales and gets 94Nm of torque, which will propel the i10 from a standstill to 62mph in 14.9 seconds and on to a top speed of 96mph. The four-cylinder 1.2-litre engine delivers 120Nm of torque and will accelerate to 62mph in 12.3 seconds and reach a top speed of 106mph. Hyundai hasn’t released any fuel consumption figures yet, but CO2 will range from 98 – 108g/km for the 1.0-litre engine and 114 – 142g/km for the 1.2 unit. The new engines are said to yield significant improvements in noise, vibration and harshness, with the utilisation of high-tensile steel that forms 29 per cent of the body structure. Other refinements include a triple-layer dashboard bulkhead with sound-deadening panel and dual door sealing strips. Hyundai has also reshaped the door mirror mounts and moved the radio antenna towards the rear of the roof to result in noise levels as low as 38dB at idle and 65dB on rough surfaces. The range begins with the new S trim at £8345, which gets 14-inch steel wheels, central locking, electric front windows and CD player. The S Air will cost an extra £650 and get air-conditioning, while the mid-trim SE costs £9295 and features remote central locking, electric rear windows, electric heated door mirrors and body colour door handles and mirrors. The range-topping Premium trim starts at £9995 and includes 14-inch alloys, Bluetooth connectivity, steering wheel controls, LED daytime running lights and door mirror indicators.